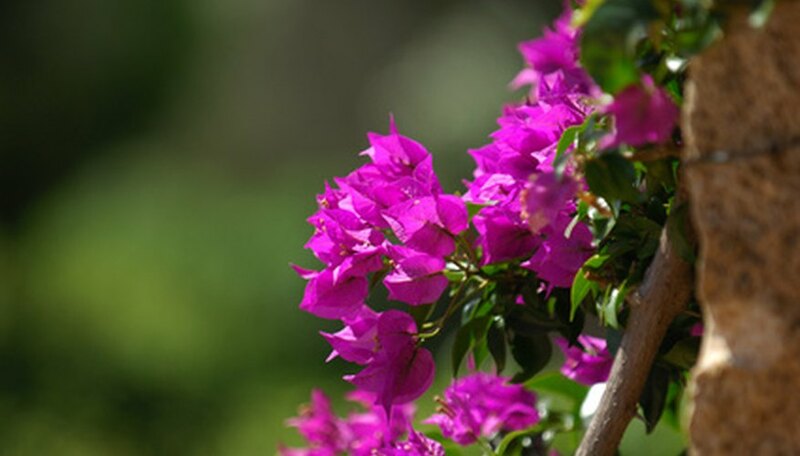 Bougainvillea's colorful flower bracts provide gardens with a splash of bright color. This vining shrub is drought- and heat-tolerant and a vigorous grower. Bougainvillea comes in hues of pink, fuchsia, red and orange. Bougainvillea spectabilis can grow up to 20 feet in either direction, while Bougainvillea glabra has a 10-foot spread in width and height. Choose a full sun location and a training system for your bougainvillea. Bougainvilleas can be trained up a railing, pole, fence, or garden trellis. Plant garden trellises 2 to 3 inches in the ground or rest them against the side of the house. Plant your bougainvillea in the ground or in a container. Dig a hole twice as wide as the container holding your bougainvillea transplant. Remove the shrub from the nursery container and break apart the root ball, unwinding any tangled roots. Place the shrub in the ground and spread out the roots with your fingers, then backfill the hole with soil. If planting bougainvillea in a container, use a container 2 inches larger than the nursery container. Choose a container with drainage holes. Water your bougainvillea until the soil is saturated. After planting, continue to water the bougainvillea periodically, allowing the soil to dry out entirely in between watering. Bougainvillea is drought-tolerant. Push developing shoots onto the trellising object as the bougainvillea plant grows. Tie the plant's woody stems to your trellis or fence using twine. This will help secure the bougainvillea to your trellising object. As the bougainvillea continues to grow, keep training new shoots onto the trellis and tying them to the trellis. Encourage plant growth with light pruning. Pinch off new shoots so the bougainvillea branches, and train all new growth onto the trellis. Prune away undesirable growth that veers away from the trellis, pole or fence. Bougainvillea is hardy to USDA zone 9b, although gardeners in other areas can grow bougainvillea as an annual.